Why Choose IQ Shield® Tempered Glass? All IQ Shield® Tempered Glass Protectors are backed by a 100% Hassle-Free, Lifetime Warranty Replacement Program. Constructed of high-quality tempered glass designed to offer unmatched scratch resistance. 99.9% transparent ballistic glass that provides true HD quality images on your device. Our 100% hassle-free lifetime warranty replacement warranty is sure to leave our competitors in awe. 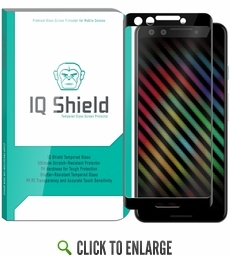 Should your IQ Shield® tempered glass screen protector for Google Pixel 3 ever need replacing, simply contact us and we will honor your request, no questions asked! 9H Hardness and Extremely Thin? That's right! Our ballistic glass Google Pixel 3 screen protectors are constructed of high-quality tempered glass that offers unmatched scratch-resistance and texture. The silky, smooth glass surface features a hardness rating of 9H that excels are resisting scratches and scrapes. Measuring at only .33mm, IQ Shield® glass offers unparalleled protection without adding unnecessary bulk. With 99.9% transparency, IQ Shield® Tempered Glass Screen Protectors for Google Pixel 3 (3D Glass - Black) offer the clearest screen protection when compared to other types of screens. A unique silicone adhesive allows you to easily install IQ Shield® tempered glass while preventing any bubbles from forming. Accurate Touch technology allows your screen to remain fully functional unlike other screen protectors that interfere with sensitivity.